Micro Arugula greens are very small in size, averaging 5-7 centimeters in length, and have 2-4 gently lobed, heart-shaped leaves connected to a slender stem. The bright green leaves are delicate, smooth, flat, tender, and thin, and are attached to a flexible light green stem. 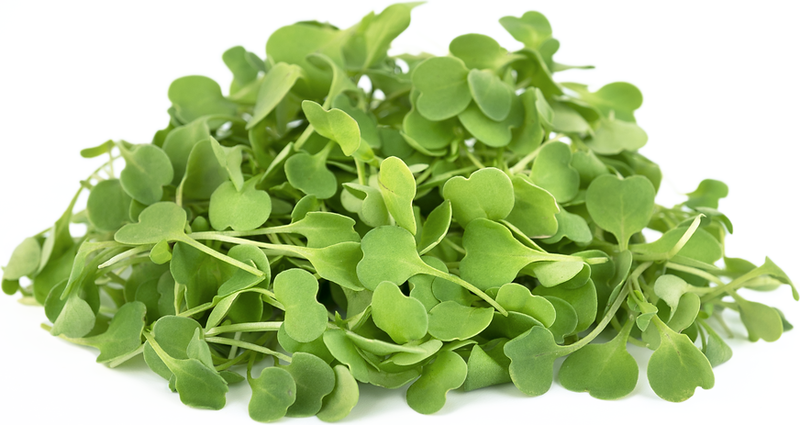 Though mild in comparison to fully grown arugula leaves, Micro Arugula is crisp, green, and has an initial nutty flavor with a hint of sweetness that fades into a peppery, earthy, and pungent bite. Micro Arugula is available year-round. Micro Arugula greens are the young, tiny, edible versions of the mature herb and are harvested approximately 14-25 days after sowing. 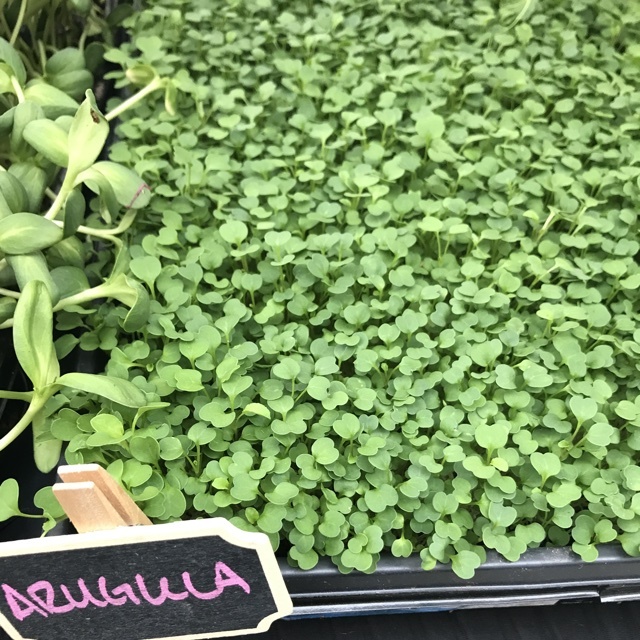 Grown in greenhouses that provide ample natural sunlight and good air circulation, Micro Arugula is favored by chefs for its peppery flavor and tender texture. Micro Arugula is most commonly used as a garnish on appetizers, side dishes, and main dishes and is utilized for its unique shape and flavor to elevate the visual appeal of the dish presentation. Micro Arugula contains vitamins A, B, C, and E, calcium, iron, potassium, antioxidants, magnesium, and phosphorus. Micro Arugula greens are intended for raw preparations, specifically as a garnish for an extra layer of flavor and texture. Though small, young, and tender, their peppery bite is best suited for savory dishes. They are best left undressed, added only at the very final stage of finishing dishes such as pasta, soups, salads, omelets, or vegetable plates. They can also be sprinkled over boiled potatoes and served as a side dish. The delicate leaves will wilt if exposed to prolonged heat and do not stand up to heavy dressings or sauces. Micro Arugula pairs well with cheeses such as Parmesan, feta, chevre, blue cheese, gorgonzola, and mozzarella, nuts such as walnuts, pine nuts, and pecans, avocado, balsamic vinegar, lemon, mint, cucumber, tomato, olives, garlic, beets, fennel, pears, grapes, prosciutto, and roast beef. They will keep 5-7 days when stored unwashed, in a sealed container, and in the refrigerator. 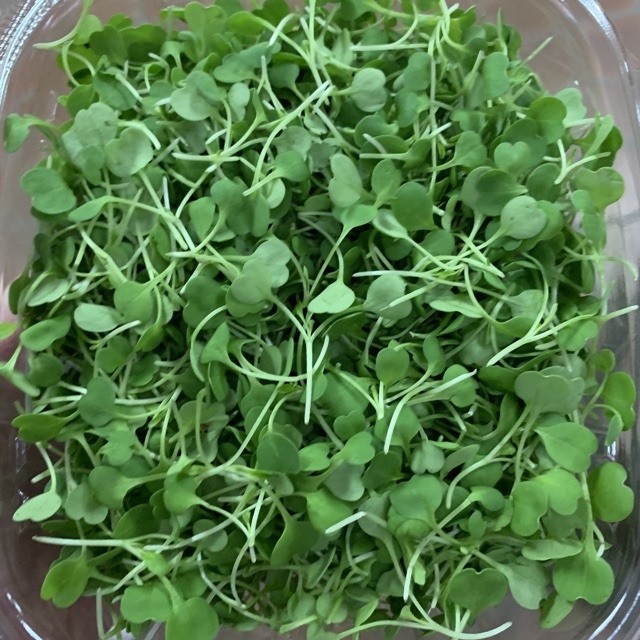 Micro Arugula was one of the first microgreens used by chefs in upscale restaurants, favored for its pungent bite, and is still one of the most popular microgreens used in culinary applications today. 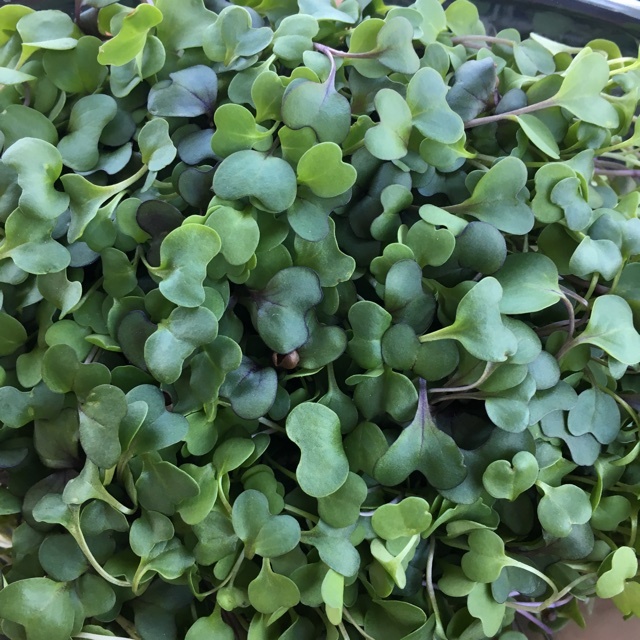 Like many other microgreens, Micro Arugula is a favorite garnish of chefs because it adds unique flavors, textures, and color to dishes with little preparation time. The greens also add value because they contain some vitamins and minerals. With consumers becoming more nutrition-conscious, these greens are a natural way to add both artistic elements mixed with nutritional benefits creating a positive dining experience for the consumer. Arugula is native to the Mediterranean and has been grown since ancient times. It was then brought to the United States by European colonists but did not become well-known until the 1990s. Micro Arugula was created in the United States in the 1980s-1990s, around the same time that the mature herb increased in popularity. Today Micro Arugula can be found at select distributors, specialty grocers, and online seed catalogs across the United States, Europe, and Asia. Recipes that include Micro Arugula. One is easiest, three is harder. People have shared Micro Arugula using the Specialty Produce app for iPhone and Android. Sharer's comments : Micro Arugula spotted at specialty produce. Sharer's comments : Micro Arugula spotted at Tomball Farmers Market H2Organics USDA Certified Organic. Sharer's comments : Micro Arugula spotted at Certified Farmers Market Old Town La Quinta. Micro arugula mixed with kale. Great spicy flavor. Sharer's comments : Micro Arugula spotted at Tomball Farmers Market H2Organics. Sharer's comments : Micro Arugula spotted at Ocean Beach Farmers Market.